When your afterlife is filled with nothing but uncertainty, being dead ain't what it's cracked up to be. 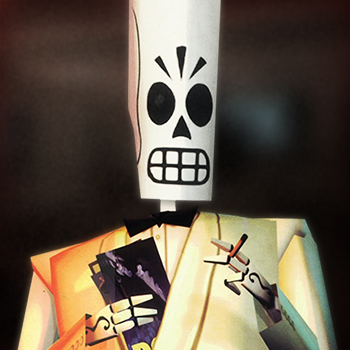 In a fair world, death would mean the end of all your earthly problems, but for Manny Calavera of Grim Fandango fame, that simply isn't the case. He gets to spend eternity stagnating in a dead end job, and watching everyone around him go on to bigger and better things. But that central concept - that death isn't the great leveller that people say it is - is more than just the backdrop for a fun adventure game. In Issue 287 of The Escapist, Brendan Main makes the case that Grim Fandango also shines a spotlight on the almost biblical ideas that underpin life and death in most other games. It's in this ambiguity that Grim Fandango stands apart ... by presenting an alternative outside [the] scheme of punishment and reward. Instead, good and bad are roughly equal, and the rules that we labor so hard to follow don't amount to a hill of beans in this crazy world. Instead, we get a game that starts at Game Over, and goes from there. Because Grim Fandango is a game that follows a very different model of life and death, it provides a thoughtful example of what happens when conventional ideas of "good" and "bad" are blurred. It's true that the Land of the Dead is not a place of torment, and there are no monstrous beings hellbent on spreading torment and misery. But there's also no purpose or sense of justice, and no order save soulless bureaucracy. [I]n Grim Fandango, as a noir-flavored adventure game, the good can rub elbows with the rotten, and it's every soul for himself. Accordingly, the game's many villains - a bloated, wheezing businessman, a slimeball salesman, a femme fatale with questionable taste in boyfriends - aren't gargantuan pillars of Pure Eebil, but just crooked folks on the take. In the absence of any sort of metaphysical justice, they've turned life eternal into the longest con.